The Story of "The Marauder"
Back in 1998, J.C. Wheeler had just started the EC-47 website. I was pretty new to the internet (as I recall I was using a company laptop and my home phone line) and this was the first website I ever "communicated" with. Lots of other guys were doing the same, and in those days there was some new addition just about daily. Now we’re lucky to get one a week. Somehow I managed to lose the contact info for the guy who’d sent me the photos. I even got J.C. to put a “help wanted” ad on the website. Unfortunately, the mystery photographer never saw the ad. About that paint touch-up . 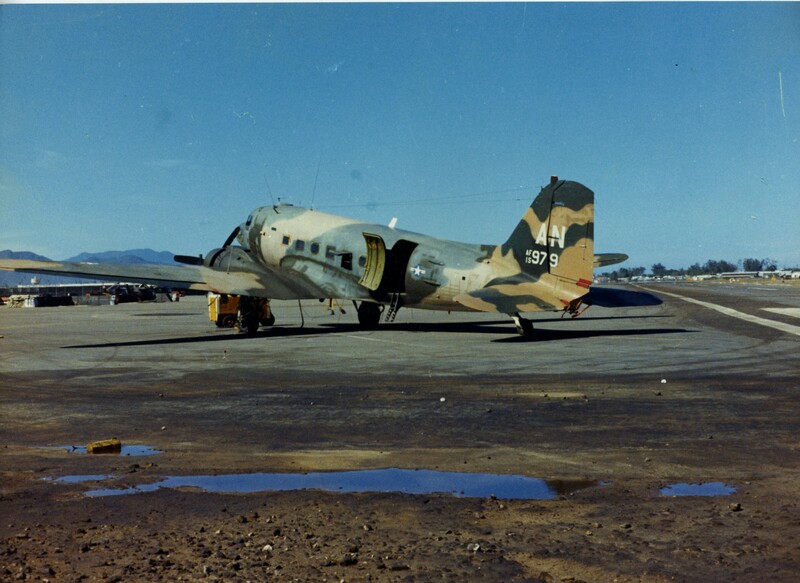 . .
On 24 Apr 68, aircraft #979 received major battle damage from anti-aircraft fire to the tail section of the aircraft while on a combat mission over Laos. Through the cool professionalism of Major Edward Sheldon, the aircraft commander, and the entire crew, they were able to make an emergency landing at Nakhon Phanom AB, Thailand. 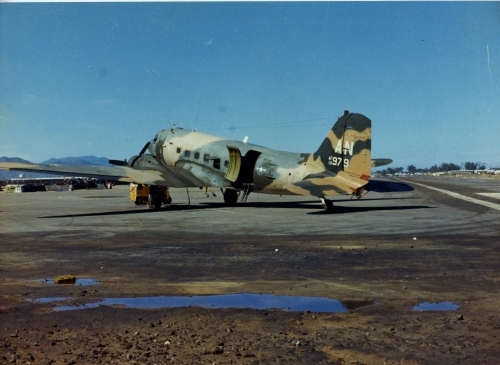 The crew was picked up by one of our squadron aircraft and returned to Pleiku. The aircraft remained at Nakhon Phanom for repairs. No casualties resulted from this incident and no casualties were recorded during this quarter. 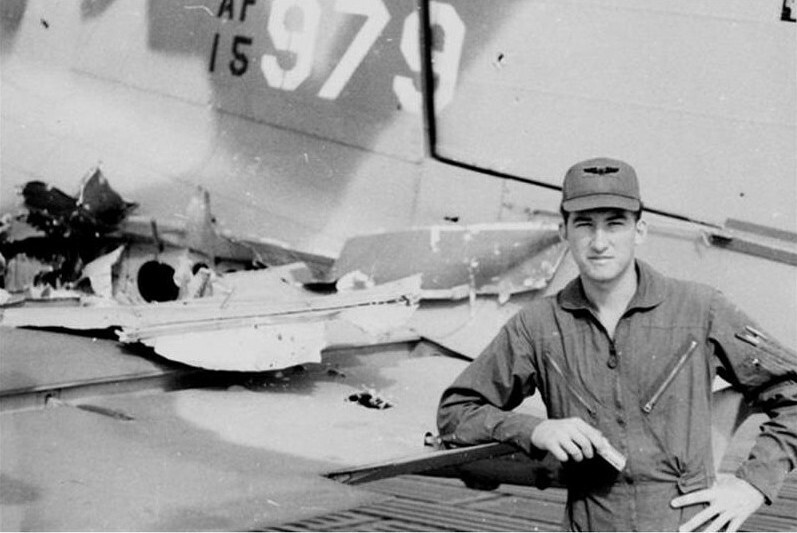 The Marauder, operating under the callsign Rare 08 when hit by a suspected 37mm round, was out of action for six weeks awaiting completion of repairs at NKP. As a result, mission restrictions were imposed for areas where known AAA threats existed. At NKP, Gail Musson poses by 979's shot-up tail. I joined the Army on April Fool's day, 1968 (some poetic justice there). 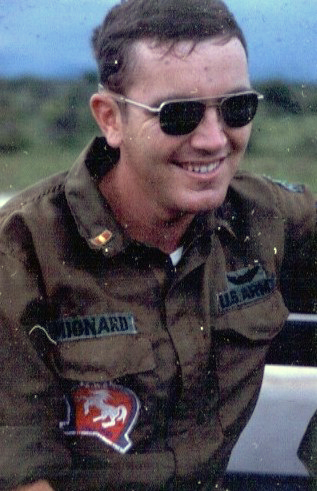 I entered the Army's Warrant Officer pilot program and graduated in April, 1969. 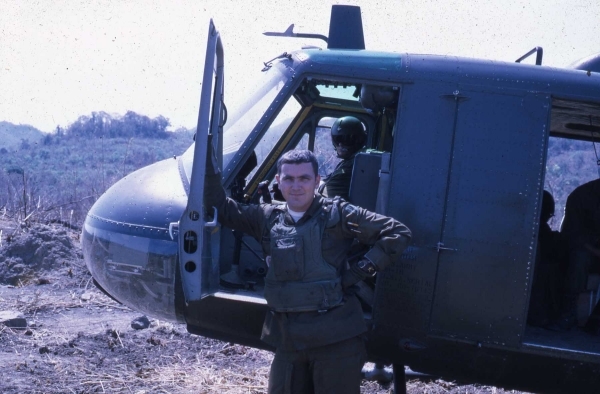 I went to Viet Nam as a first assignment (along with 99% of my flight school class) and was assigned to the 92nd Assault Helicopter Company at Dong Ba Thin (across the bay from Cam Rahn Air Base). I was in Viet Nam from May 69 to May 70. I've always been fascinated with airplanes and have photographed them for as long as I can remember. The photos of 979 were taken while I was at Nha Trang waiting to pick up some 5th Special Forces Group folks. She was parked right next to us. The crew gave us a really interesting tour of the airplane. I was struck by the obvious repainting of the empennage. The crew said it had been shot up and the new paint covered the repairs. I switched over to the Air Force after Viet Nam and flew Rescue helicopters (UH-1N and HH-3E's) for the rest of my military career. We don't know why "The Marauder" happened to be at Nha Trang when Rob photographed her. Far as we can tell, 979 was still assigned to the 362nd TEWS at Pleiku at that time. 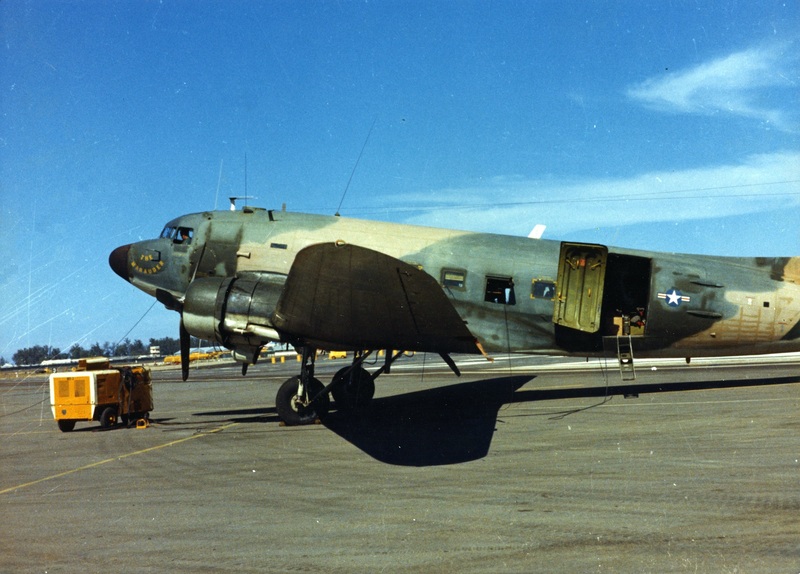 Another minor EC-47 mystery . . . . Thanks, Rob, for connecting a few more EC-47 dots!